Canon's iconic ELPH has always been a show-off, with the looks and smarts that make you want to carry it out in the open for everyone to see. 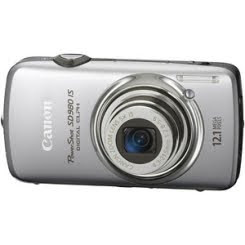 The PowerShot SD980 IS takes the concept even further with Canon's first-ever touch panel interface. The camera that invented sleek and slim is equipped with a huge 3-inch PureColor System LCD screen that responds to your touch, delivering operation that's as natural and intuitive as cutting-edge technology should be.